Connecticut form CT-1040 is designed for state residents to report their annual income. 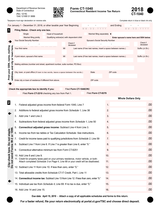 The form features space to include your income, marital status as well as space to report any children or dependents you may have. By filling out the form, you will see whether or not you owe money to the state or if you will receive a refund.